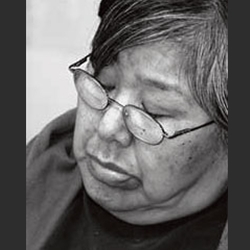 Pitaloosie was born in 1942 on the southwest coast of Baffin Island near what is now the community of Cape Dorset. She spent her childhood years in various hospitals in Quebec and Ontario for treatment of tuberculosis. She learned English during this time, and recalls the difficulty she experienced in relearning her native language upon her return to Baffin Island in 1957. She is now one of the few of her generation who speak both English and Inuktitut fluently. Pitaloosie began drawing in the early 1960’s, and quickly established herself as a versatile and intelligent graphic artist. Over the years, she has become a familiar presence in the Kinngait Studios, and her work has been included in annual print collections since 1968. Pitaloosie is represented in the 2011 print collection by Ravens’ Reel (2011-28), a masterful drawing of two ravens dancing to a traditional whaler’s reel. Since the late 1960’s, Pitaloosie has made frequent trips to southern Canada to attend exhibitions and conferences. In 1967, she spentseveral weeks in Toronto while her husband, the well-known sculptor Pauta Saila, participated in an International Sculpture Symposium. Subsequently, she has visited Halifax, Toronto, Ottawa, Kansas City and Vermont. Her work has been featured in solo drawing exhibitions, and in 1977, Canada Post issued a stamp depicting her print, Fisherman’s Dream. Her 1985 lithograph entitled In the Hills represented the Northwest Territories in the centennial celebration of the National Parks of Canada. Amnesty International, the international human rights organization, selected a drawing by Pitaloosie entitled Mother and Child to use for their 1990 Christmas card. She was also one of nine featured artists in the acclaimed exhibition Isumavut: The Artistic Expression of Nine Cape Dorset Women, which opened at the Canadian Museum of Civilization in the fall of 1994 and continues to travel to other venues.